The Konnekt touch screen video phone brings you high-quality, face-to-face calling with two-way video and sound. It’s a dedicated appliance that’s incredibly simple to use, highly personalized and reliable. It’s incredibly simple! Easier to use than a telephone or TV, very large, and loud enough to share a smile and talk at a distance. Your family and friends worldwide can talk to you face-to-face from their mobile, iPad, tablet, PC, Mac, another Videophone, or any device that runs the free Skype application. Surprise each other on a special occasion, bring a smile to their day, or just share time together – all without the need to travel. You can also make voice calls to any domestic “landline” phone and almost any landline overseas. Talk to your contacts as often as you want, as long as you like, at any time. Calls are unlimited. You never again need to worry about running out of minutes. Find and reach your contacts without the frustration! We set up each call button the way you choose – for example, to first try to connect face-to-face (to the contact’s mobile, tablet or computer), then their office, and finally their home phone. No need to spend your time looking up and trying different numbers or contacts… the Konnekt touch screen videophone does it for you. We can even set it up to avoid voicemail and answering machines by hanging up and retrying, or by moving to the next number, just before your contact’s voicemail answers. Share and talk about your most precious memories with ease! 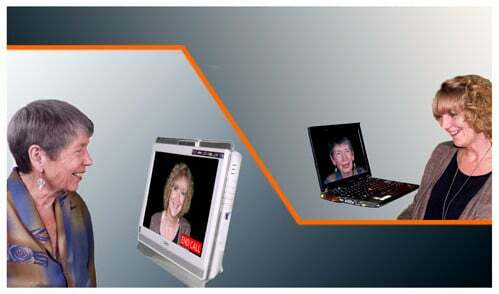 Friends and family can use a computer to show you their photos, a slideshow, web pictures or almost anything that’s on their computer screen. It simply appears on your touch screen video phone during a call while you’re talking – even if they’re half way around the world. The Videophone user does not have to do a thing… just sit back, enjoy the show and talk about those magic moments.